Go to original pattern for design DROPS 201-38. Knitted shawl in DROPS Fabel. The piece is worked in garter stitch with stripes and short rows. Measurements: Width at top: approx. 160 cm = 63”. Length in middle: approx. 69 cm 27”. 21 stitches in width and 41 rows in height with garter stitch = 10 x 10 cm = 4” x 4”. DROPS CIRCULAR NEEDLE SIZE 3.5 MM = US 4: length 80 cm = 32”. 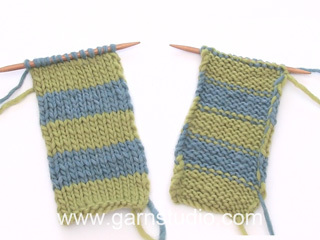 Decrease 1 stitch inside the 2 stitches in garter stitch by knitting 2 together. Repeat the decrease alternately every, and every 2nd, row from the right side a total of 26 times in each repeat (there are 5 repeats on the shawl). Each time you start on a new repeat with short rows, start the decreases again; i.e. you decrease 26 stitches on each repeat. NOTE: Change of color is at the beginning of a row from the right side (= bottom edge of shawl). Make sure the strand is not tight between changes! STRIPE-1: * 1 ridge with wooden rose, 1 ridge with off white *, work from *-* until repeat 1 has been completed = 40 ridges. STRIPE-2: * 1 ridge with wooden rose, 1 ridge with off white *, work from *-* until repeat 2 has been completed = 40 ridges. STRIPE-3: * 1 ridge with sand, 1 ridge with off white *, work from *-* until repeat 3 has been completed = 40 ridges. STRIPE-4: * 1 ridge with rose mist, 1 ridge with off white *, work from *-* until repeat 4 has been completed = 40 ridges. STRIPE-5: * 1 ridge with wooden rose, 1 ridge with off white *, work from *-* until repeat 5 has been completed = 40 ridges. 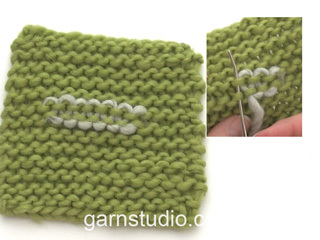 To avoid holes when turning the piece during short rows, tighten the strand before continuing. The piece is worked back and forth in 5 repeats with short rows and STRIPES – read description above. 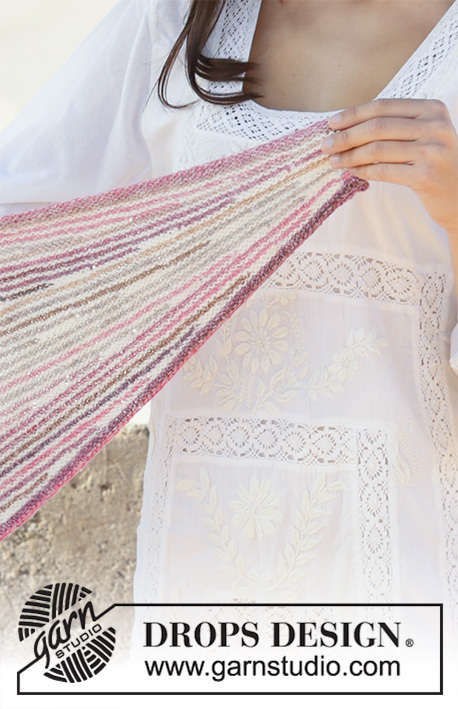 Begin at the top of the shawl and work down towards the one bottom edge. The whole piece is worked in GARTER STITCH - read description above. Cast on 336 stitches with circular needle size 3.5 = US 4 and rose mist. Knit 4 rows (= 2 ridges). ROW 1 (right side): Knit all stitches, turn. 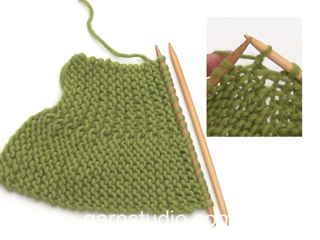 ROW 3: Knit until there are 4 stitches left, turn – read KNITTING TIP! ROW 5: Knit until there are 8 stitches more left than on the previous row from the right side, turn. ROW 7: Knit until there are 8 stitches more left than on the previous row from the right side, turn. ROW 8: Knit back. REMEMBER THE KNITTING GAUGE! Continue like this and work until there are 8 stitches more left than on the previous row from the right side 33 more times (= a total of 35 times), then work until there are 9 more stitches left than on previous row, a total of 2 times. When all the short rows have been worked you have 39 ridges and have decreased 26 stitches = 310 stitches on row. Knit until there are 4 stitches left, turn and knit back. Repeat 1 = 40 ridges. 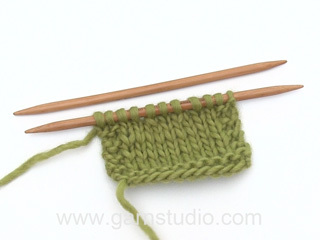 ROW 3: Knit until there are 4 stitches left, turn – remember KNITTING TIP! Continue like this and work until there are 8 stitches more left than on the previous row from the right side 11 more times (= a total of 13 times), then work until there are 7 stitches more left than the previous row a total of 24 times. When all the short rows have been worked you have 39 ridges and decreased 26 stitches = 284 stitches on the row. Knit until there are 4 stitches left, turn and knit back. Repeat 2 = 40 ridges. ROW 5: Knit until there are 7 more stitches left than on the previous row from the right side, turn. ROW 7. Knit until there are 7 more stitches left than on the previous row from the right side, turn. Continue like this and work until there are 7 more stitches left than the previous row from the right side 22 more times (= a total of 24 times), then work until there are 6 more stitches left than the previous row from the right side a total of 13 times. When all the short rows have been worked you have 39 ridges and decreased 26 stitches = 258 stitches on row. Knit until there are 4 stitches left, turn and knit back. Repeat 3 = 40 ridges. ROW 5: Knit until there are 6 more stitches left than on the previous row from the right side, turn. ROW 7. Knit until there are 6 more stitches left than on the previous row from the right side, turn. Continue like this and work until there are 6 more stitches left than the previous row from the right side 33 more times (= a total of 35 times), then work until there are 5 more stitches left than the previous row from the right side a total of 2 times. When all the short rows have been worked you have 39 ridges and decreased 26 stitches = 232 stitches on row. Knit until there are 4 stitches left, turn and knit back. Repeat 4 = 40 ridges. ROW 7: Knit until there are 6 more stitches left than on the previous row from the right side, turn. Continue like this and work until there are 6 more stitches left than the previous row from the right side 7 more times (= a total of 9 times), then work until there are 5 more stitches left than the previous row from the right side a total of 28 times. When all the short rows have been worked you have 39 ridges and decreased 26 stitches = 206 stitches on row. Knit until there are 4 stitches left, turn and knit back. Repeat 5 = 40 ridges. Work 2 ridges back and forth over all stitches with wooden rose. Bind off with knit, but to avoid the bind-off edge being tight you can make 1 yarn over after each 5th stitch. Yarn overs bind off as normal stitches. Bellissimo, penso che lo farò!